Contemporary Yet Timeless; This is the Perfect Design for a Man or a Woman. Suitable for Any and All Occasions Too. 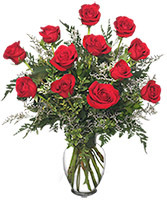 A Dozen Red Roses Arranged in a Glass Vase; Accented with a Delicate Limonium, Baby's Breath, or Waxflower. A Timeless Classic. We Love a Vase of Spray Roses! 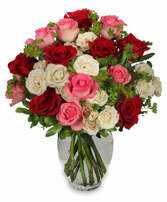 They Convey a Kind of Softness that Standard Roses Just Cannot- All with NO Overpowering Fragrance! They Last Longer (and Cost Less) than a Standard Dozen Too! 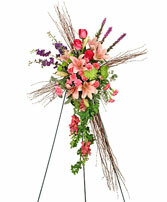 A Hand Bundled Cross of Birch Branch & a Textural Mix of Green Foliage Provide a Unique Background for a Fresh Spray of Colorful Larkspur, Lilies, Snapdragons, Roses, Carnations, Mums, & More. 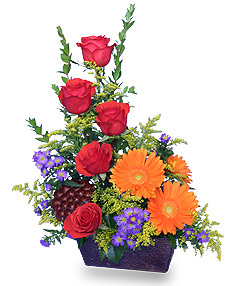 Let Us Help You Convey Your Sympathy with This Stunning Token of Your Love and Appreciation for the Departed.